Getting a job right after graduation is not easy. In fact, if you haven’t already began preparing for this day since the last semester, you will soon realize that you have your work cut out for you. 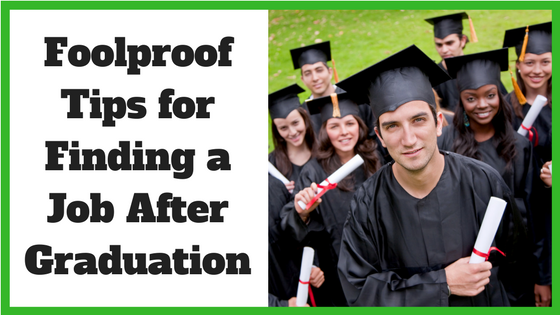 Are you soon completing your graduation and have no idea about what lies ahead? If some of your college friends are already being selected for a campus interview and others are opting to pursue master’s degree, you might feel like you are way behind in your efforts and going nowhere. What’s more, when you begin to explore your options and see your peers going down their different paths, you may find yourself at the crossroads and facing difficulty in making vital decisions that might mould your life. If you have decided to get some work experience before going for higher studies, you will eventually begin hunting for a job that suits your areas of interest. Take time to draft a grammatically correct and constructive resume for each of the job postings you apply for. Ask for guidance from a mentor, family member or friend to ensure you haven’t made any spelling or grammar errors and that it reads well; a second set of eyes can make a big difference. If you need extra help with your resume, there are great services our there that offer resume templates to help you put your together or you can enlist the help of a career coach. You’ll also want to take the time to learn all you can about the organization you want to work with, through their website, Google searches and websites like Glassdoor. With many competitors in the race, make sure you use relevant keywords that will make you stand apart from others. Instead of using the common keywords, use the ones that employers have used on their website and in the job posting. Doing so will help to capture the attention of the recruiter. Securing a job is no cakewalk. Hence, even after your college ends, keep yourselves busy to fill in the gap. Enrol in online courses or skill-enhancement classes that will help you get more certification and training in your field and make you distinct from others. Volunteer for a cause that you are truly passionate about. Even if you do not get paid, you will get some experience and that never goes waste. In the age of social media, obtaining the candidate’s complete information can happen in just a matter of seconds. Make sure you have a professional email, adjust the privacy settings on your social networking sites, remove all childish or derogatory posts and always keep your professional profile updated. Make your connections strong by attending mass recruitment drives, job fairs, networking events and even Meetups for job seekers. Growing your professional network is essential and can lead to many more opportunities that may have otherwise been missed, so get out there. Many students make the mistake of neglecting to network while in college, so if you are still studying, get started now! Keeping track of all of the positions you applied for and noting the date you sent in your resume and cover letter is the key to keeping on top of your job search. Schedule time each day when you will be checking on the status of various applications and looking for new opportunities. Apart from the consultant websites, try to get referrals from your friends for the job. When the time comes to meet with the interviewer or hiring manager, enter your interview with confidence by going into it well prepared. Take care to dress professionally, in line with their dress code (if you are not sure what that is, dress up). It will make you look smart and put together and will also make you feel comfortable as the process can get extended by hours owing to the crowd. You must be alert at the time of your interview. Try to avoid fidgeting with your fingers or sitting clumsily in front of the hiring manager. Furthermore, never roll your eyes or look in other directions while answering questions. Rehearse the commonly asked interview questions with a friend, family member or your career coach, to get clear on your answers in advance, so you can be confident going in. Practice your 30-second elevator pitch, your answers and even your handshake. Once you are done with your interview, don’t forget to send the interviewer a thank-you note. By following up and taking the time to send a note, you convey your interest in the position, while also showing that you are a thoughtful person with an attention to detail. Thinking of hiring a career coach to help you find a job after graduation? Browse our directory of career coaches and get a FREE consultation or request a personalized coach recommendation!